A good friend of mine once asked me why I enjoyed reading so much. “How can you just sit there for hours,” she wanted to know, “doing nothing but staring at a book? I just don’t have the patience for that!” I have to admit that I found her question so odd that I couldn’t think of an answer right away. Especially since I know that my friend really enjoys watching movies, which the last time I checked, also involves sitting still for long periods of time. And while I do enjoy a good movie, if I were given the choice between reading a book or watching a movie or television show, I’ll pick reading every single time. A movie shows me things, in its own way and in its own good time, and sometimes with jerky camera movements that leave me feeling just a little bit motion sick. A book, on the other hand, tells the story with words, and there are always plenty of details that are left to the reader’s imagination. That means each of us are going to picture the characters, the action, and the setting just a little bit differently, so that reading a story becomes so much more personal that simply watching the action on a screen. And I don’t know about anyone else, but I usually imagine the main character looking at least a little like people I know, and that makes them very real. In a movie, you are stuck with what the actor actually looks like. Words, if put together skillfully, can convey the subtle nuance, off-beat humor, and shared insights that make reading such a joy. 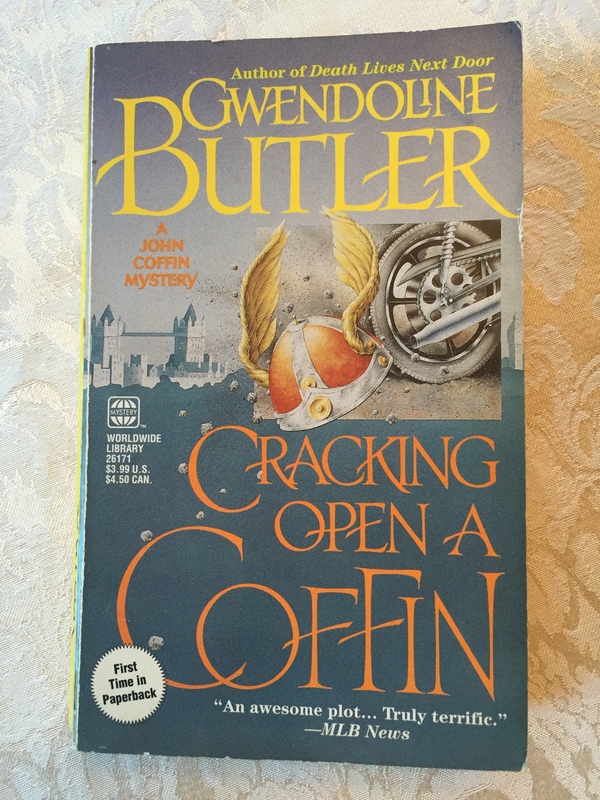 I enjoy the mysteries of Gwendoline Butler, not so much for their plots (which are good), but for her way with words. In her book Cracking Open A Coffin, she describes the main character, John Coffin, sitting at a table listening to his companion’s troubles. His dog, Bob, is underneath the table with his head resting heavily on Coffin’s foot, which is beginning to go numb. She writes: “Coffin looked his sympathy and tried again to shift Bob from his foot. Bob sank deeper down.” Anyone who has experience with a stubborn dog knows exactly how one can “sink deeper down” when it wants to stay put. But that’s not something that could easily be shared on a screen. When I’m reading a good book, I am truly seeing the world from someone else’s eyes, because everything is told through the narrator’s perspective. I know what the character is thinking, not just saying and doing. I may be a middle-aged, middle class Protestant woman, but after reading Tracy Chevalier’s The Last Runaway, I know what it feels like to be a young, broke,Quaker girl from England who is struggling to start a new life in Ohio in the 1850’s. That’s a gift. And although I don’t read poetry nearly as much as I should, a good poem can pack so much meaning into just a few simple words. My college yearbook used these words from Chidiock Tichborne as a memorial to a student who died during the school year: “My thread is cut, and yet it is not spun. And now I live, and now my life is done.” Exactly. So yes, I know I spend a good portion of my life with my nose in a book. But there are so many good books out there, and so many authors whose words are just waiting to be read, and so much to experience, enjoy, and learn from them. Personally, I can think of very few better ways to spend my time. What a wonderful quote! Thank you! There always seems to be more books than time to read them all. But there are few things in life like immersing yourself in a terrific story. Exactly….whenever I am feeling overwhelmed or stressed, I just take the time to read a good book. And then my bad mood just disappears! Thanks, George! This reminds me to tell you of a good book about Ireland—Star of the Sea by Joseph O’Connor. It is fiction, but probably better described as “faction” or “historical fiction.” It centers around a famine ship traveling from Ireland to America in the mid-1800s. I was at a panel discussion in Sligo where an American professor was introducing O’Connor to the audience. She said that Star of the Sea is required reading for her students, because she believes it gives an excellent picture of what Ireland was like in the 19th century. When you come here, you will see that the famine continues to play a strong role in the psyche of the Irish; and this book personalized that period of time for me. As we were driving around Connemara, I could visualize the barren plots of land and the starving people struggling against the cold, rainy climate. Thanks for the recommendation! I’ll definitely read that before my visit. I love having the chance to understand the history of any place I visit. Agreed! We must be channeling each other. Stay tuned for my post today! ha ha. Just read it! And we are definitely on the same wave length! I like watching movies and like reading books, but I enjoy them in different ways. I think you explain some of the main differences very well and much more clearly than I would have done. Forgot to add that the book was far superior to the movie. Yes, books let us know so much more about what it going on in the character’s minds, and that makes it so much easier to understand and/or relate to them. I do like movies, but will always prefer books. Thanks for the comment! I agree with you completely! I would rather read a book than watch a movie but most of my reading is done at the end of the day and I read until I am sleepy with stacks of books by my bed. Or I will take one with me if I have to wait somewhere. Good post! Thank you! And I like to read at the end of the day, too! It’s very relaxing, unless I get so involved in the book that I stay up too late reading….